I’ve been feeling a bit nostalgic these last few days. On Wednesday morning I got together with a wonderful family whom I had not seen for a while. I first met them during my second year of grad school, and for several years we hung out almost daily; they quickly became my Boston family. Although schedules get busy (as they always manage to do) we still find time to get together. This past Wednesday we caught up over lunch and reminisced about goofy stories and fun memories from the past. It was wonderful. On my drive home while I continued reflecting on those memories, I began thinking about all of the different snacks we would eat after class, with one of the most popular being quesadillas. 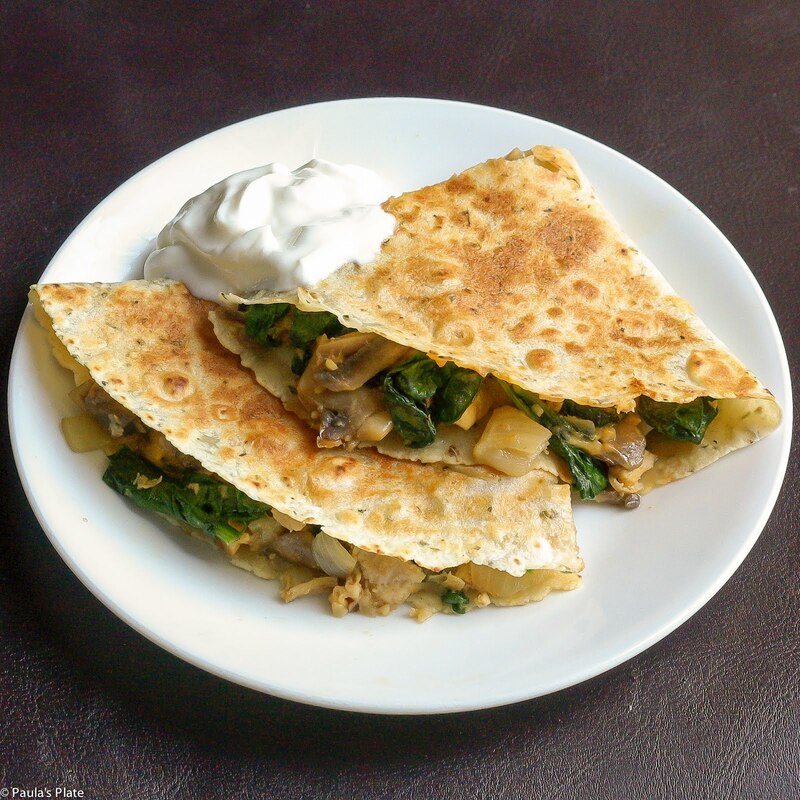 In the past, our quesadillas were bare bones basic – cheese and tortillas. That’s it. Wanting to recreate a new version for dinner, I decided to fill my quesadillas with a few more ingredients. 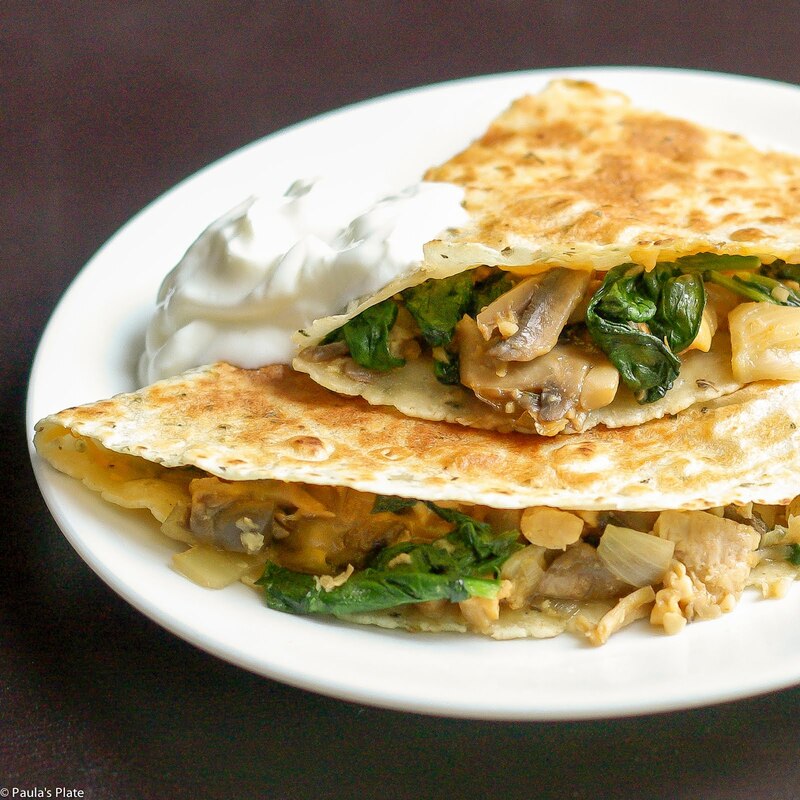 Sautéed onions, mushrooms, spinach, and chicken add tons of flavor to this tried and true classic; top it off with some melty cheddar, and you have a delicious and easy meal in under 30 minutes. What are your favorite meals from the past? Let me know below! Heat oil in a large pan over medium heat. Add onion and mushrooms and cook for 5-7 minutes or until juices release and mushrooms begin to brown. Add in garlic and cook and additional minute. Add in chicken and spices, stir until spices are evenly distributed. Add spinach, salt and pepper. Stir for about 2 minutes or until spinach is wilted. Turn off the heat. Sprinkle one tortilla with 1/4 cup shredded cheese. Spoon 1/2 chicken and vegetable mixture on top of cheese, then top with an additional 1/4 cup cheese. Top with another flour tortilla. Heat a large nonstick skillet over medium heat. Carefully place 1 quesadilla in pan and cook 3 minutes. Using a large spatula, flip quesadilla and cook an additional 3 minutes until lightly browned and cheese is melted. Repeat with second quesadilla. Slice each quesadilla into quarters and top with salsa and sour cream. Recipe slightly adapted from Ellie Krieger’s So Easy cookbook.